Four years ago I moved to the city we now live in – I wasn’t too keen on it as it meant leaving a busy city like London behind. If hate weren’t such a harsh word, I’d use it to describe what I felt :-/. The masjid itself is massive in size – so beautifully built and it is something you would admire if you drive passed it. So beautiful that even Yusra recently pointed it out to us, calling it a “pretty masjid”. But the beauty and size didn’t matter – it gave off a cold feeling to me and I remember talking to Abu Yusra that day, saying how I will never like this city, it’s a different world to what I’m used to. Moving away from the negativity, here I want to share how after 4 years I think the city is finally becoming home. When I say home, I don’t actually mean the physical city (I still have issues with how small it is, or how there’s not much to do etc.) but home is comfort and I think I’m slowly finding a comfort that I’d like to embrace. I came from a lifestyle that consisted of meeting lots of sisters and visiting the masjid all the time. It was ‘normal’ to be surrounded by Muslims (One of my old post talks about this). My love for the masjid began in my late teens when a friend from work took me to pray Asr salah at a masjid – this masjid is also big and lovely inside and out (I think it might even be on the verge of becoming a landmark :-)). Over time the masjid became the reason I learnt more about our beautiful deen, I found, it became a little sanctuary for me. I would listen to talks there, attend classes, and if I were nearby, I’d go in, to pray. I even remember going after work on some nights – just to get away from feeling overwhelmed. There I’d meet sisters from all walks of life, from all the corners of the world and somehow in having just a 2/3 minute conversation with them, they’d leave me feeling inspired and motivated to become a better Muslim. Anyways, lets get on to the story properly. So through the power of positive social media use, I happened to find another masjid. I’ve been keeping up with their updates and it seems like they do lots for sisters. I’ve been to jummah there a few times and I loved it. Just before Ramadan I joined a Tafseer class and have met lots of sisters through it. I’m learning heaps and I’ve been sharing bits of what I learn on my Instagram and Facebook page. 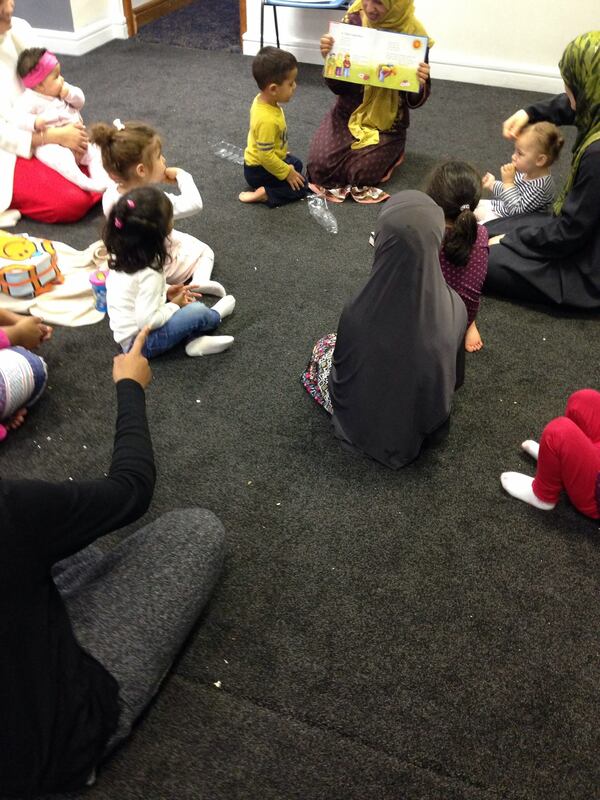 Now, more recently the masjid has set up what they’ve called ‘Messy Play’ for mums and pre-schoolers. After the fourth session, I can from my heart express that it makes me happy from the soul. Yes, a very big statement to make. But there’s a reason. In our second session, whilst one of the sisters sat us all down for story time and we then recited Surah al-Fatihah and al-Ikhlas, I sat there looking at all the sisters and children. We all spoke a different language to each other, we all came from different cultural backgrounds. We had sisters that spoke Swahili, Arabic, Urdu, Latvian, Bengali, Punjabi – but we all sat and recited Quran. This. This very thing! This is the sign of our Ummah. The great Ummah of the Prophet (saw) that lives miles away from the Muslim lands yet unites on the basis of the belief in Allah. 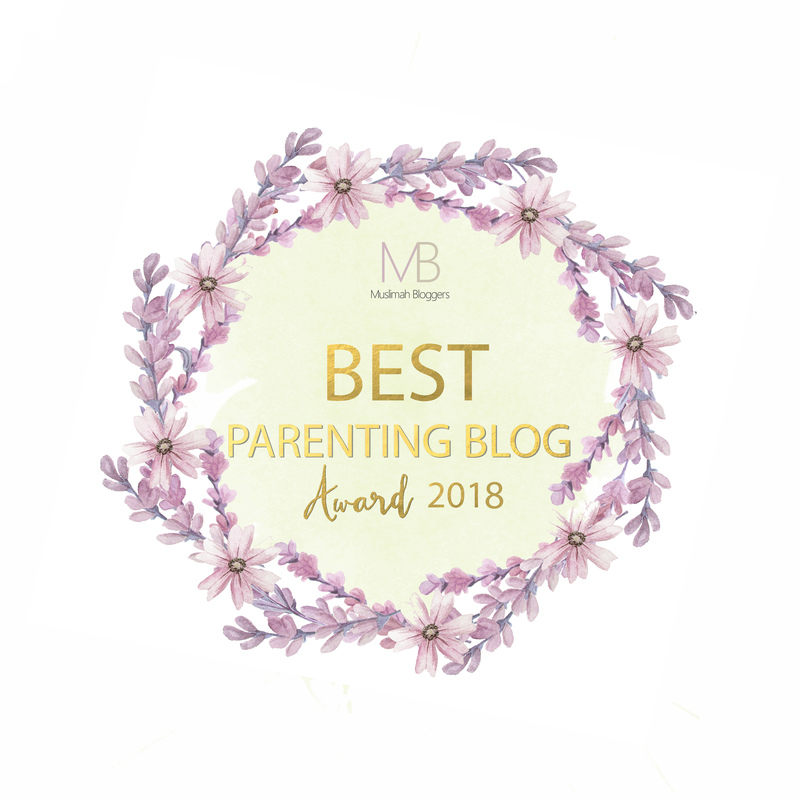 I need to add here that I’ve taken Yusra to other playgroups too, really lovely ones with brilliant resources – where we’ve both enjoyed ourselves. But the sessions at the masjid provides a platform for me to expose my daughter to the sisterhood that exists in our deen. It allows her to see other women who are also bringing up their children with similar ‘rules’ to me. Some may think I’m making a big deal out of something – but it means a great deal to me, to be able to meet other sisters – sisters who love the deen as much as I do and to know that there is a masjid that caters for the needs of the Muslim community. Through this masjid, I have met sisters who dedicate time outside their busy lives for the masjid. These sisters are mothers, they are professionals, yet they make time. Time they give for the sake of Allah – who doesn’t want to witness that? I know how it makes me feel, it makes me want to be like them. This time they give, inshaAllah will weigh greatly on the scales and I find inspiration in such actions. Masjids play a big part in uniting the community. Often masjids are seen as only somewhere to pray. But the real essence of a masjid lies with how it can bring people together, to allow people to feel like they are part of an ummah. If we look at the role the Prophet’s (saw) masjid in Medinah had, it did much more than allow the early Muslims to pray. It was a learning centre. It wasn’t a mark of architectural excellence, was actually more like a simple hut. But it taught the biggest lessons; it was where people went to know more about Allah. It is very sad, that in some Muslim communities the masjid is just for the men. I’ve heard of scary stories where sisters have been asked to pray outside in the car park because they’re not allowed in the masjid (real story about someone I actually know). Some of these masjids are massive – and yes, I agree that the best place for a woman to pray is at home – but the best place for a woman to learn is probably the masjid. No masjid committee is probably reading this, but I wish they did. I wish we could tell them to do more for us. Women, who are mothers, daughters, wives need their masjids to do things for them. We have the big responsibility of nurturing and bringing up a whole generation of future Muslims, please think about that when you sit to make decisions about what happens in a masjid. I think I’ve gone off track now. So coming back to how this masjid has helped me make this city my home. Well, I now feel I can go somewhere and not be judged by the language my parents speak or the shade of the South-Asian skin colour I have. I feel I belong not because of anything else but my faith. And I love it. I think I see a light at the end of the tunnel – I think I might slowly be able to make this my home. I’m slowly feeling less isolated away from my family and friends – I think I feel a lot more positive about living here now. And all because a masjid allowed me to feel Muslim. 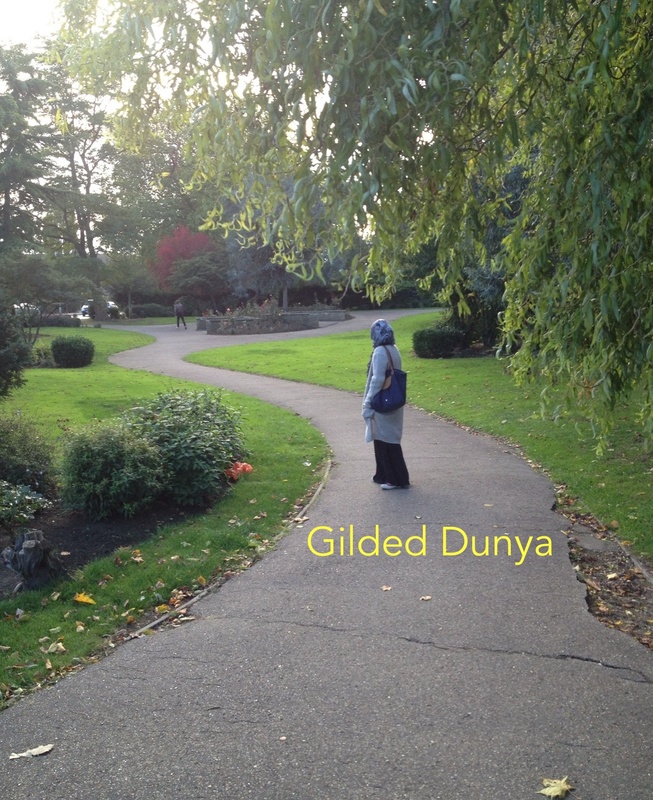 Please remember me in your duas – much love and duas to the Ummah I am so happy to be a part of.